Product features * 29 Tuft * Extra Soft * Straight cut bristles * Item #138 Product description29 tuft extra soft bristles toothbrush with an oval head and straight cut end-rounded bristles with a slightly raised tip. The handle is ergonomically designed to comfortably fit in the palm of a child's hand. Offers a nice premium rubber grip for ease of use and added comfort. For ages 4-10. Product features * 32 Tuft * Extra Soft * Straight cut bristles * Item #8202 Product description32 tuft extra soft bristles toothbrush with an oval head and straight cut end-rounded bristles with a slightly raised tip. The handle is ergonomically designed to comfortably fit in the palm, and the unique rubber grip for ease of use and added comfort. For ages 10 and up. This brush is also excellent for use on adults that desire a small headed brush with an adult handle. Can be used as an adult compact. Product features * 23 Tuft * Extra Soft * Straight cut bristles * Item #151 Product description23 tuft extra soft bristles toothbrush with an oval head and straight cut end-rounded bristles with a slightly raised tip. The handle is ergonomically designed and extra thick to make it easy for a young child to grip. Offers a nice premium rubber grip for ease of use and added comfort. For ages 2-7. Product features * NEW! 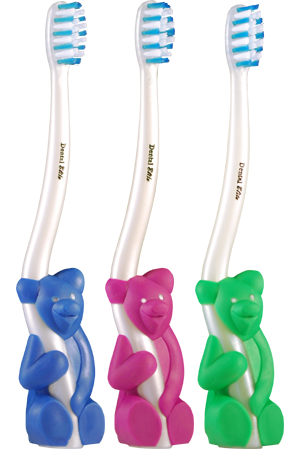 * 24 Tufts * Large Bear handle makes it easy for children to hold * Extra-Soft End Rounded Bristles * 144ct cases * 4 colors, 2 male & 2 female * Item #BEAR Product description24 tuft extra soft bristles toothbrush with an oval head and end-rounded bristles. The handle is ergonomically designed to comfortably fit in the hands of young children. 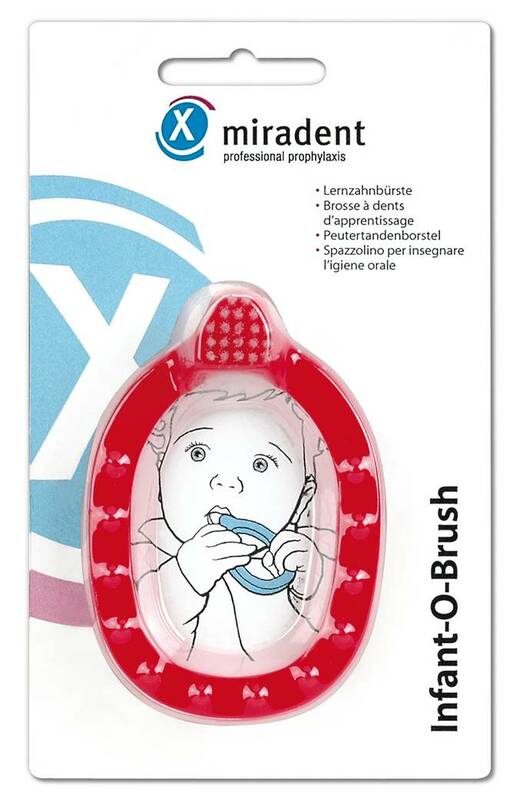 This product makes brushing fun for children. Excellent for ages 2-6. (This brush cannot be imprinted upon since there is no flat surface). The earlier, the better" - this is especially true for tooth care. The miradent Infant-O-Brush trains infants up to the age of 4 in their tooth care with the greatest of ease. The bristles are extremely soft and the shape of the brush makes a playful handling easier, serving as a teething ring and making it safe from swallowing.